The fighting that made up the Tet Offensive lasted for several days in some South Vietnamese cities. 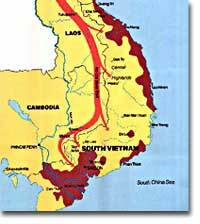 This map shows the route taken by North Vietnamese troops. During the Buddhist holiday of Tet, over 80,000 Vietcong troops emerged from their tunnels and attacked nearly every major metropolitan center in South Vietnam. Surprise strikes were made at the American base at Danang, and even the seemingly impenetrable American embassy in Saigon was attacked. During the weeks that followed, the South Vietnamese army and U.S. ground forces recaptured all of the lost territory, inflicting twice as many casualties on the Vietcong as suffered by the Americans. The showdown was a military victory for the United States, but American morale suffered an insurmountable blow. When Operation Rolling Thunder began in 1965, only 15 percent of the American public opposed the war effort in Vietnam. As late as January 1968, only a few weeks before Tet, only 28 percent of the American public labeled themselves "doves." But by April 1968, six weeks after the Tet Offensive, "doves" outnumbered "hawks" 42 to 41 percent. Only 28% of the American people were satisfied with President Johnson's handling of the war. The Tet Offensive convinced many Americans that government statements about the war being nearly over were false. After three years of intense bombing, billions of dollars and 500,000 troops, the VC proved themselves capable of attacking anywhere they chose. The message was simple: this war was not almost over. The end was nowhere in sight. Declining public support brought declining troop morale. Many soldiers questioned the wisdom of American involvement. Soldiers indulged in alcohol, marijuana, and even heroin to escape their daily horrors. Incidents of "fragging," or the murder of officers by their own troops increased in the years that followed Tet. Soldiers who completed their yearlong tour of duty often found hostile receptions upon returning to the states. Following the Tet Offensive, General William Westmoreland called for an additional 200,000 troops to help break the resolve of the Vietcong. But President Lyndon B. Johnson's rejection of the proposal showed that America's commitment to the war in Vietnam was waning. 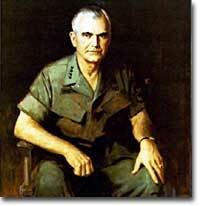 After Tet, General Westmoreland requested an additional 200,000 troops to put added pressure on the Vietcong. His request was denied. President Johnson knew that activating that many reserves, bringing the total American commitment to nearly three quarters of a million soldiers was not politically tenable. The North Vietnamese sensed the crumbling of American resolve. They knew that the longer the war raged, the more antiwar sentiment in America would grow. They gambled that the American people would demand troop withdrawals before the military met its objectives. For the next five years they pretended to negotiate with United States, making proposals they knew would be rejected. With each passing day, the number of "hawks" in America decreased. Only a small percentage of Americans objected to the war on moral grounds, but a growing majority saw the war as an effort whose price of victory was way too high. Less a military offensive than a diplomatic showing of clout, Operation Rolling Thunder was never fully supported by the U.S. Air Force leadership. Read about this bombing campaign that last from 1965 until 1968. On January 31, 1968, the Vietnamese New Year, North Vietnamese forces launched an all-out invasion on nearly every major city and military base in South Vietnam. 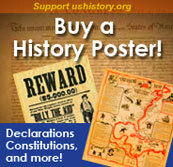 The invasion was repelled, but at a cost of lives and American belief in the war effort. Images help to explain this biographical excerpt of the leader of the Viet Cong, General Vo Nguyen Giap and the Tet Offensive.